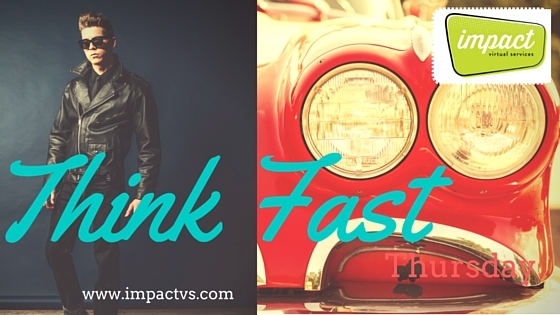 THINK FAST THURSDAY: $250 CASH for YOUR Business! "THINK FAST!" It's what people would say in the 50s when someone was about to throw something your way. Every Thursday, we throw your way a series of helpful information in our weekly social media posts and BLOG, "Think Fast Thursday." Ready for this? Give us an 'R' or referral and impact Virtual Services will give you $250 if that referral turns into a new client contract! Just email our Founder and CEO, Jodi Fisher with your referral: jodi@impactvs.com. THINK FAST! Get some cash! WAY OUT WEDNESDAY: Pimp Your Biz on Periscope!